The tomb of Shah Rukn-e-Alam was built between 1320 and 1324, is an unmatched pre-Moghul masterpiece. The Mausoleum of Rukn-i-Alam could possibly be considered as the glory of Multan. From whichever side the city is approached, the most prominent thing that can be seen from miles all around is a huge dome. This dome is the Shrine of the saint. The tomb is located on the southwest side of the Fort premises. This elegant building is an octagon, 51 feet 9 inches in diameter internally, with walls 41 feet 4 inches high and 13 feet 3 inches thick, supported at the angles by sloping towers. Over this is a smaller octagon 25 feet 8 inches, on the exterior side, and 26 feet 10 inches high, leaving a narrow passage all round the top of the lower storey for the Moazzan, or public caller to prayers. The whole is surmounted by a hemispherical dome of 58 feet external diameter. The total height of the building, including a plinth of 3 feet, is 100 feet. As it stands on the high ground, the total height above the road level is 150 feet. Besides its religious importance, the mausoleum is also of considerable archaeological value as its dome is reputed to be the second largest in the world, after Gol Gumbaz of Bijapur, India, which is the largest. The mausoleum is built entirely of red brick, bounded with beams of shisham wood, which have now turned black after so many centuries. The whole of the exterior is elaborately ornamented with glazed tile panels, string-courses and battlements. Colors used are dark blue, azure, and white, contrasted with the deep red of the finely polished bricks. The tomb was said to have been built by Ghias-ud-din Tuphlak (r. 1320-1325) for himself during the days of his governorship of Depalpur, between 1320 and 1324 AD, but was given by his son, Muhammad bin Tughluq to the descendents of Shah Rukn-e-Alam for the latter’s burial in 1330. The mausoleum of Rukn-e-Alam has been admired by not only the travelers and chroniclers but also by the art-historians and archaeologist who wrote the architectural history of the subcontinent. The Mazar of Rukn-i-Alam is the glory of multan. When the city is approached from any side the most prominent thing which can be seen from miles all around is a huge dome. 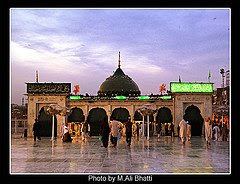 This dome is the Shrine of Sheikh Rukn-ud-Din Abul Fath commonly known by the title Rukn-e-Alam (pillar of the world). The tomb is located on the south-West side of the Fort premises. In beauty and grandeur so other dome perhaps equals it This elegant building is an octagon, 51 feet 9 inches in diameter internally, with walls 41 feet 4 inches high and 13 feet 3 inches thick, supported at the angles by sloping towers. Over this is a smaller octagon 25 feet 8 inches, on the exterior side, and 26 feet 1 0 inches high, leaving a narrow passage all round the top of the lower story for the Moazzan, or public caller to prayers. The whole is surmounted by hemishperical dome of 58 feet external diameter. The total height of the building, including a plinth of 3 feet, is 100 feet. As it stands on the high ground, the total height above the road level is 150 feet. This contributes materially to the majestic and colossal appearance of the tomb, making it the most prominent object of view to the visitors. Besides its religious importance, the mausoleum is also of considerable archaeological value as its dome is reputed to be the second largest in the world after 'Gol Gumbad' of Bijapur (India), which is the largest. The mausoleum is built entirely of red brick, bounded with beams of Shisham wood, which have now turned black after so many centuries. The whole of the exterior is elaborately ornamented with glazed tile panels, string courses and battlements. Colors used are dark blue, azure, and white, but these are contrasted with the deep red of the finely polished bricks, while the result is both effective and pleasing. These mosaics are not like those of later day's plane surfaces, but the patterns are raised from half an inch to two inches above the background. This mode of construction must have been very difficult but its increased effect is undeniable, as it unites all the beauty and variety of colors with the light and shade of a raised pattern. Golra Sharif isa shrine of the Sufi Saint Pir Meher Ali Shah in Islamabad, Pakistan. 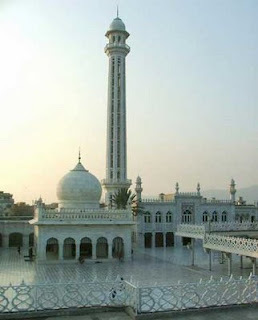 Shrine of Pir Meher Ali Shah of Golra Sharif is located 18 km from Rawalpindi, in sector E-11 of Islamabad. He was born in 1859, preached and spread the message of Islam during the turbulent times in South Asia. He also wrote beautiful prose and poetry in Persian, Arabic and Punjabi languages. His mausoleum was recently reconstructed comprising of a dome, and a high minaret built with marble. 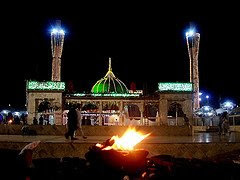 Hazrat Pir Syed Mehr ‘Ali Shah of Golra Sharif (to be referred to hereinafter simply as “Hadrat”) was a descendent, on his father’s side, of Hazrat Syedna Ghaus- e- Azam Shaikh ‘ Abdul Qadir Jilani in the 25th generation, and of the Holy Prophet of Islam through Syedna Hasan ibn ‘Ali in the 38th generation. On the side of his mother, he was descended from Hazrat Ghaus-e-Azam in the 24thHoly Prophet through Syedna Husain ibn ‘Ali in the 37th generation and from the generation. Two of Hazrat’s ancestors,Pir Syed Roshan Din Shah and Pir Syed Rasul Shah in the year 1211 A.H. by the then head of Syedna Ghaus-e-Azam’s shrine at Baghdad (Iraq), Hazrat Syed habib-e-Mustafa Ibn Syed Qasim Qadiri. This testimonial is preserved in original in Golra Sharif’s shrine records, and its text is reproduced below. 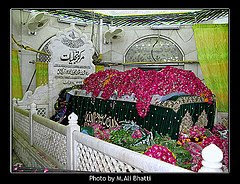 Hazrat Syed Pir Meher Ali Shah (R.A) was born on Monday, 1st Ramadan, 1275 A.H (14th April 1859 A.D) in Golra Sharif. The time before Hazrat’s birth saw the war of independence of 1857 being fought between the British and the Muslims. There have been many different saying about his death date, and different scholars have stated different dates. Some have stated that he died in 445 h, Darashiku, the author writes in Safina-tul-Awliya states in between 465-466 h and Prof. Nicholson states that he may have died in between 465-469 h. Even after the confusion was his exact death date we have one factor for sure that his death was in 5th century Hijri. When he arrived in Lahore, he build a mosque and his room where he stayed, at the same room he gave up his blessed soul. His blessed Khalifah Hazrat Shekih Hindi lead is funeral prayers and buried him in his blessed room, where his tomb stands to this date after nearly 965 years and is still an active lace for Sufis and other Muslims for spiritual favours and benefits. It is related that you have died on 9th Muharram 465 hijri. Every year at this date the Ghusal Mubarak takes place where thousands of people attend from all over the world. After nearly 20 days, on 19th Safar your blessed Urs takes place. On 20th Safar the blessed Urs of Sayed-us-Shuhuda Hazrat Imam Hussain takes place. Whereas on 18th of Safar of every year after the prayers of Magrib the Ghusal Mubarak takes place and Chadar's are placed his blessed tomb. When the great saint arrived in Lahore he also build a new mosque where he stayed. When the mosque was build there was disagreement between the scholars and the great saint regarding the direction of the mosque to kaba. When the mosque was build the great saint invited all the leading scholars of the city to come to the mosque and pray. Prophet Muhammad PBUH names and of various Quranic Ayats. In this mosque abut 50 000 people can attend the prayers easily. There has been every arrangement for those people who wish to pray and there has been good facilities provided at the complex. There is also different educational institutes established for the purposes of reaching the teaching the Islamic knowledge such as Awliya and Jamia Hujwiria. At these institutionals there are always Islamic functions held such as Melad Sharif (Prophet Muhammad PBUH blessed Birthday), Naats Functions & Qawaali in specially build halls. There is also one official Research Centre woking for the researching into teachings of Hazrat Data Ganj Bakhsh called ?Ali Hujwiri Chair? in Pakistan?s oldest Univerity of Punjab, Lahore. There are also plans to build a new university called ?Ali Hujwiri University?. There is also health, social and clinical centres established such as Data Darbar Hospital, Daskari School and centre for the distribution of Drewry. Source Book ?Hazrat Data Ganj Bakhsh and Department of Religious and Aukaaf, Punjab Lahore, Pakistan. When a 'Salik' (an aspirant/ Student of Sufism) goes through the Path of Sufism (Tariqat) achieving various stages (manazil) it reaches a point where the Soul (Nafs) leaves the clothes of Humanity and his heart becomes the everlasting praise of Allah. At this moment, Allah reveals various secrets to the hearts of the Saints giving them his special mercy (Marifiat) and this stage is also called Waliyat (Sainthood). Then Allah favours them with other special bounties where the Saint's inner and outer becomes cleaned and his heart shines like Sun, and his Love attracts people to the Islam. Hazrat Syed Ali Hujwiri reached this stage, Allah Tala appointed him to the land of Lahore in order to spread the word of Truth and Islam. And this is our special honour and happiness that the leader of all Sufis Hazrat DataGanj Bakhsh preached Islam in this land. Many hindus were converted at his blessed hands, and that's why we can say that Alhumdillah we are Muslims. Hazrat Syed Ali Hujwiri came Lahore at the time when Sultan Mehmood Ghaznawi was in power. Along with Hazrat Syed Ali Hujwiri was Hazrat Abu Saeed Hujwiri and Hazrat Hamaad Sarkushi. At that time the Prince Muj bin Masood was deputy head of Ghaznawi Dynasty and the city Lahore was under going various developments, which was helping the city of Lahore to emerge as Centre point of Asia. It is also difficult to say what exact date Hazrat Data Ganj Bakhsh came to Lahore but it is thought that he came in 431 hijri. In Fawaied Al-Foeid, Hazrat Nizamuddin Awliya Mut 's Malfozaat's analysis, which was complied by his khalifah (Successor) Mir Hasan, writes in the sitting of 29 Zil Qadaah 708 hijri 10 May 1309 that Shekih Syed Ali Hujwiri and Skeikh Hussien were Mureed and did Bayt to one Murshid. Skiekh Hussien was settled in Lahore from long time and one day Hazrat Syed Ali's Mursheed said to him, you should move to Lahore now, on this he replied that Shekih Hussien was already there then his mursheed said you should go, therefore you left for Lahore and reached at night time and at that night Sheikh Hussien died and the next morning it was his funeral. Different scholars have stated various points regarding Hazrat Syed Ali Hujwiri marriage life. Howver the main source of information has been his book, and lets see what he says regarding it. After completing his initial Islamic education in Ghazna at the hands of greatest Sufi Saints and Awliya Allah he decided to travel far and wide across many Islamic countries such as Syria to Turkistan, Tus, Uzkand, Mihna, Merv, Samarkand, Iraq, India, and Afghanistan to gain further spiritual knowledge and meet various Sufi Saints. He also visited the holy lands of Makkah and Madinah Sharif where he performed two hajj. He visited various Sufi Shrines and tombs and received much spiritual blessings that also benefited in spreading Islam across the Indian continent. He mentions at times in his book that there were many hard times during his travelling but he managed with them all. During this time, he used to go to different places and invited people to Islam with love, peace and noble message. Many people accepted Islam at his hands due to his great conduct, manners, spirituality and love. He met a record 300 Shekihs of Khurasan, ?who had such mystical endowments that a singly man of them would have been enough for the whole world?. He himself makes this statement about them in his book Kashf al-Mahjub, translated into English by Prof. Nicholson, Page 174, Published by Darul Ishaat, Pakistan. Here are some of the Sheikhs whom he met, 1. Sheikh Al-Qasim Sari, 2. Grand Sheikh Abul Hasan bin Saliba, 3. Sheikh Abu Ishaq bin Shahriyar, 4. Sheikh Zaki bin Al-Ala, 5. Sheikh Abul Hasan Ali bin Bakran, 6. Sheikh Abdullah Junaidi, 7. Sheikh Abu Tahir Makshuf, 8. Sheikh Ahmed bin Khurqani, 9. Sheikh Mujtahid Abul Abbas, 10. Sheikh Rashid Muzaffar bin Abu Said, 11. Khwaja Sheikh Ahmed Hammadi of Sarakhs and 12. Sheikh Ahmed Najjar. May Allah be pleased with them all. Source Kashf al-Mahjub, translated into English by Prof. Nicholson, Page 172, 173 & 174, Published by Darul Ishaat, Pakistan. He used to wear simple clothes and did not approve of wearing highly expensive clothes. He used to select his way of dressing himself. He further sates in his renowned book Kashf al-Mahjub that Others, again, do not trouble themselves about clothes at all. They wear either a religious habit (aba) or an ordinary coat (qaba), whichever God may have given them; and if he keeps them naked, they remain in that state. I, who am Ali b. Uthman al-Jullabi, approve of this doctrine.